Few people dare brave the unexplored mysteries of Gamma World™ ... but heroes do. New races, new monsters and new mysteries await those with the courage to face them. Undaunted by danger, heroes cross the changing lands and seas, bringing home knowledge and power for personal glory and the good of their own tribe. The Final Wars changed everything - and then things kept changing. Find out how people and civilizations vary between continents, and learn some of the secrets waiting in unsuspected corners and depths. This sourcebook includes both extensive information about Gamma World and rules and advice for inventing new details. 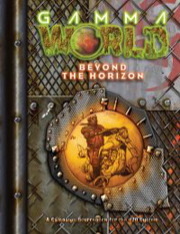 Sign in to start a discussion about Gamma World: Beyond the Horizon (d20)!